TORONTO, September 11, 2017 -- Canadian Orebodies Inc. (the “Company”) (TSXV:CORE) is pleased to announce the second batch of core assays from its summer drill campaign at the Wire Lake Project. The program consisted of twenty-two holes being drilled (WL-2017-001 to 009, 009A, and 010 to 021) totaling 3,069 metres. Complete assay results have been received from the next seven holes, which were drilled along the Wire Lake Gold Zone (WL-2017-008 to WL-2017-014). Highlights from these results include: 1.4 gpt Au over 32.4 metres including 4.2 gpt Au over 5.0 metres in WL-2017-011; and 1.4 gpt Au over 18.8 metres, including 5.3 gpt Au over 3.1 metres in WL-2017-013. "Wire Lake continues to deliver very exciting gold results which help reinforce our knowledge of the Wire Lake Gold Zone and demonstrate how much potential the property holds,” said Gordon McKinnon, President and CEO of Canadian Orebodies. "This is an expansive gold system and we are very early into showing its full potential. The assays received to date cover a strike length of approximately 1,700 metres and we look forward to continuing to define and expand on this gold-rich structure." 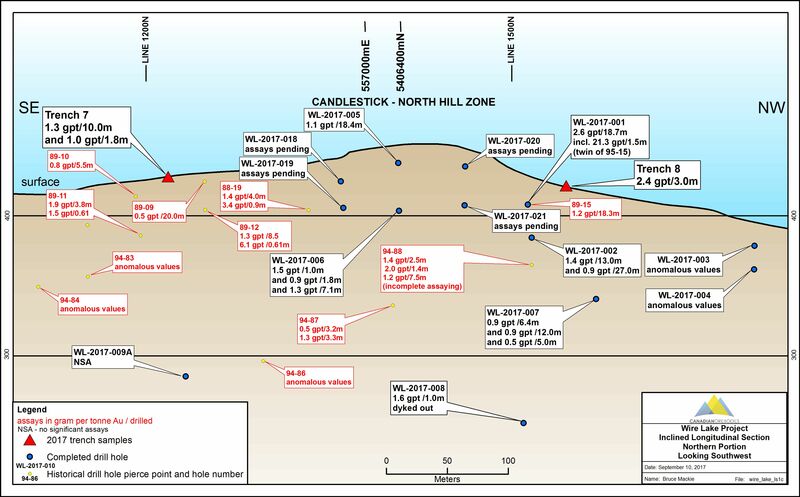 Drill hole WL-2017-008 was drilled vertically to intersect the Wire Lake Gold Zone at a depth of 160-180 metres and approximately 130 metres down dip of hole WL-2017-002 which returned 1.4 gpt Au over 13.0 metres and 0.9 gpt Au over 27.0 metres (see press release dated August 21, 2017). At the expected depth the hole intersected a post mineral diabase dyke. After exiting the diabase dyke the hole encountered a narrow zone of altered mafic volcanics between 187.4 to 194.2 metres containing anomalous gold values including 1.6 gpt Au over 1.0 metre (190.0-191.0 metres). Hole WL-2017-009 had to be abandoned and was re-drilled as WL-2017-009A. It was drilled at an angle of -75 degrees and an azimuth of 250 degrees. The hole was collared to test the down dip extension of the Candlestick Zone with a corresponding I.P. chargeability anomaly. Between 155.05 and 215.1 metres a broad interval of variably altered volcanics was encountered containing locally up to 10% pyrite-pyrrhotite. Alteration observed was predominantly carbonate +/- quartz and not the usual silica-biotite alteration observed in the other holes. Only anomalous gold values were returned. Hole WL-2017-010 was drilled at an azimuth of 70 degrees at -45 degrees. It was drilled to test a gap in the historic drilling between the Lucky Seven and Candlestick Zones and to test the Wire Lake Gold Zone at the same elevation as WL-2017-011 (see below). Assay results included: 0.7 gpt Au over 5.3 metres (161.2-166.5 metres) and 2.7 gpt Au over 4.7 metres (187.3-192.0 metres). Both gold bearing zones were hosted by altered mafic volcanics displaying moderate to strong silicification with associated biotite/chlorite alteration which hosted quartz flooded patches and stringers containing minor pyrite-pyrrhotite. Diamond drill hole WL-2017-011 was drilled proximal to historic hole 89-07 into the Lucky Seven Zone at an azimuth of 72 degrees and an angle of -46 degrees. Hole 89-07 encountered two gold bearing zones between 122.83-130.76 metres (2.5 gpt Au over 7.9 metres, including 5.6 gpt Au over 3.1 metres1) as well as between 165.2-178.31 metres (13.1 metres of 1.5 gpt Au including 2.3 metres of 4.3 gpt1) suggesting that the Wire Lake Gold Zone may be bifurcating or there is potentially a second gold zone in the Candlestick Area. Hole WL-2017-11 confirmed the presence of two gold bearing zones. Between 127.0 and 133.0 metres (6.0 metres), an interval of strong biotite and silica alteration containing 5% pyrrhotite and 5-20% quartz stringers which assayed 1.7 gpt Au was encountered. The hole intersected a second zone of moderate biotite/chlorite alteration with trace to 1% pyrite-pyrrhotite and local silicification, which returned 1.4 gpt Au over 32.4 metres (155.0 to 187.4 metres) including 4.2 gpt Au over 5.0 metres (180.4-185.4 metres). Hole WL-2017-012 was drilled on the West Zone where a single historic hole 89-18 intersected two narrow intervals running 5.0 gpt Au over 0.9 metres and 2.3 gpt Au over 0.9 metres near the bottom of the hole1. The hole intersected a 4.3 metre wide zone of anomalous gold values (>100ppb Au) approximately 70 metres down dip from the above mentioned intervals including a 0.7 gpt Au over 2.2 metre section (123.4 to 125.6 metres). The gold values are hosted within a zone that is very similar in appearance to the Wire Lake Gold Zone (moderate biotite alteration, up to 50% quartz veining and 1-2% disseminated pyrrhotite-pyrite). While the assay results are not economic, they do support the presence of a second gold bearing structure approximately 500 metres west of the Wire Lake Gold Zone. The Company is currently mobilizing linecutting and I.P. crews into the area. WL-2017-013 was collared to test a 250 metre gap in the historic drilling north of the South Lake Zone. Between 9.8 and 69.8 metres it intercepted a post mineralization diabase dyke. Immediately after getting out of the diabase the hole entered the Wire Lake Gold Zone. Assay results included 1.4 gpt Au over 18.8 metres (69.8-88.6 metres) including 5.3 gpt Au over 3.1 metres (69.8-72.9 metres). Host rocks were moderately silicified, locally strongly foliated, mafic volcanics containing quartz stringers and frequent sections of 2-5% disseminated pyrrhotite +/- pyrite. Hole WL-2017-014 was collared to test a recently discovered showing where surface grab samples returned values up to 6.96 gpt Au that was coincident with an I.P. chargeability anomaly (see press release dated July 10, 2017). The hole encountered several narrow bands of interflow sediments (chert-argillite) hosted by mafic volcanics that contain up to 10% disseminated and fracture related pyrite, pyrrhotite +/- chalcopyrite. No significant gold values were returned. Canadian Orebodies has implemented a quality-control program to comply with best practices in the collection and analysis of rock samples. Samples were transported in security-sealed bags to Activation Laboratories Ltd. in Thunder Bay, ON for preparation and assay. 1 Readers are cautioned that these assay results are historical in nature and have not been verified by a qualified person on behalf of the company. This press release has been prepared under the supervision of Mr. Bruce Mackie (P.Geo. ), who is a consultant to the Company and a "qualified person" (as such term is defined in National Instrument 43-101). Mr. Mackie has verified the technical data disclosed in this press release. Certain information set forth in this news release may contain forward-looking statements that involve substantial known and unknown risks and uncertainties, including, but not limited to, exploration results, potential mineralization, statements relating to mineral resources, and the Company’s plans with respect to the exploration and development of its properties. These forward-looking statements are subject to numerous risks and uncertainties, certain of which are beyond the control of Canadian Orebodies, including, but not limited to, the impact of general economic conditions, industry conditions, volatility of commodity prices, risks associated with the uncertainty of exploration results and estimates, currency fluctuations, dependency upon regulatory approvals, the uncertainty of obtaining additional financing and exploration risk. Readers are cautioned that the assumptions used in the preparation of such information, although considered reasonable at the time of preparation, may prove to be imprecise and, as such, undue reliance should not be placed on forward-looking statements.